With a significant amount of fanfare the once again reconfigured The Smashing Pumpkins have released their ninth album, Monuments to Elegy. Original member and founder of the band, Billy Corgan remains at the helm with a disc that harkens back to the Siamese Dream era. This release finds Corgan and Co. having produced the most easily listened to record since their glory days of Melon Collie and the Infinite Sadness in the 90’s. The band for a time held the title of the most critically acclaimed band of the 90’s. The Smashing Pumpkins fell apart due to internal fighting, drug use and dismal sales; the original lineup was gone by 2000. Many listeners have held that for way too long Billy Corgan has not kept the promise of recreating a better version of the Pumpkins. After Adore, Corgan filtered through a number of supporting musicians. Thankfully after 15 years in the wilderness, The Smashing Pumpkins might be heading for a musical Renaissance. Corgan called upon his current collaborator Jeff Schroeder to provide guitar, and the news making addition of Tommy Lee on drums for the studio recording. On tour Pumpkins will be utilizing Brad Wilk from Rage Against the Machine on drums, and The Killers’, Mark Stoermer on Bass. Monuments was produced by Corgan, Schroeder and Howard Willing, with David Bottrill mixing and Howie Weinberg mastering the release. In many of The Smashing Pumpkins albums released after Adore, there have been moments of brilliance, moments of loathsomeness, and blandness in between. A great number of listeners have relegated Smashing Pumpkins to musical history and moved on. The 2012 album Oceania showed promise producing two notable tracks, The Celestials and Panopticon. Taken as a whole, Oceania is best described as a techno and synth laden recording. On Monument Corgan is returning to old school Smashing Pumpkins, the release is a guitar album with synthesizers and drum machines pushed to the edges. What results is instant impact. Surprisingly the lyrics are a bit vague in places. Corgan seem stuck with some of the best music he has come up with in many years, yet has nothing much to say in the songs. Brevity and getting to the point maybe the tool that helps this release over the line, in the attempt to reclaiming some of the acclaim that was once associated with the Pumpkins. The entire disc clocks in at a mere 33 minutes. It is nine songs of concise shiny alternative rock. A scintillating tune, Tiberius jumps out of the gate with so much promise. Hitting the sweet spot as it returns to Siamese Dream days. There are equal amount of awesome accompaniment and Billy’s trademark whine. There is also a feeling of age and wisdom gained from the passing of the years in Corgan’s delivery. Being Beige is a strong song, that is working within the palette of what makes a good Smashing Pumpkins song. The song contains a large sound with lyrics that are introspective and yet strike a universal chord for any listener. This song is easily identifiable as a Smashing Pumpkins song. The almost Pixies like intro of Anaise is pleasing. However the song styling is a little bit outside of Corgan’s bag of tricks. The song has a slightly disjointed feeling. The promise of the song is never fulfilled. This the point where I feared the record was headed to the dreaded mediocre part of the disc, which has happened many times of late on Smashing Pumpkins recordings. For the record I want to state that I don’t hate Tommy Lee’s drumming on the disc, and that is something, as I am not a big fan of his prior work. The production on the drumming was deft, and does not distract and actually enhances many of the songs and this one in particular. One and All has the messy trademark Pumpkins intro, and then an outstanding guitar attack. This song could have come straight off of Melon Collie. It would fit in with Zero and Bullet with Butterfly Wings. This song washes away the concerns I had on Anaise. Unfortunately, then Run 2 Me happens. Almost a classic example of when synths attack. Again the song is very disjointed. Corgan seems to be trying to do his best Bono impression very unconvincingly. Mainly because he does not have Bono’s vocal range and the authenticity that is necessary to pull off a song like this one with out sounding foolish. After that low point, Drum and Fife whirled to life and brought things back around. 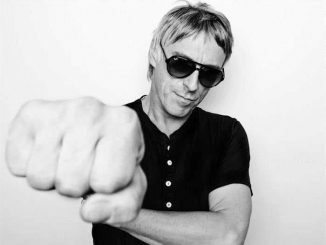 This song has a real Brian Jonestown Massacre feel. As the track gains momentum it sweeps you along. In the song Corgan declares he will not quit, “I am going to bang this drum till my dying day.” With more songs like this he just might fulfill that promise. Monuments is again classic SP dipping again into everything that made Siamese Dream and Melon Collie great. The synth sounds like it belongs in this song with out causing chaos. There is a nice interaction between the guitar work and drums, it is perfectly balanced. Dorian I am less enthusiastic about, the song reminds me of Simple Minds, which is well and good because I love Simple Minds, but not such a great thing for Smashing Pumpkins. It is a mediocre song neither awful nor great. It has convinced me that Billy Corgan is not a convincing love song singer. The song does have some great shoegazing bits. Anti Hero is a loud rocker that swings once again back into Billy Corgan’s wheelhouse. The dirty guitar layering married to Corgan’s voice is a winning combination. Smashing Pumpkins does loud fantastically well, and this is a loud song. This song actually made me wish the release was longer with more songs like this one. 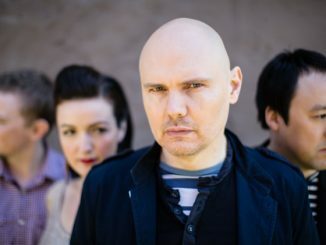 The album feels a little like swings and roundabouts, but hopefully in the end begins a new chapter for Smashing Pumpkins. Corgan and his latest incarnation will probably never be as popular as in they were in their heyday, but it is nice to see him return to the land of the living. This is an album for longtime loyalists, newer converts that have liked Oceania and for fair weather fans who still dream of the reformation of the original lineup. One gets the impression that Corgan is preaching to the converted rather than trying for any new zealots. I have to ding the release for the three lackluster songs on such a brief disc, but to my mind it is an improvement on the more recent releases. If you ever liked The Smashing Pumpkins in the past, this release justifies giving the band another try.